ORCID integration has been at the heart of our publishing system since our inception. We like to think that this demonstrates that ScienceOpen was already thinking way ahead of the curve for the future of publishing, and recognising the importance of infrastructure and the value of unique identifiers. ORCID is now a major part of the scholarly communications infrastructure, and becoming more so with each passing day. At ScienceOpen, registration with us requires registration with ORCID. 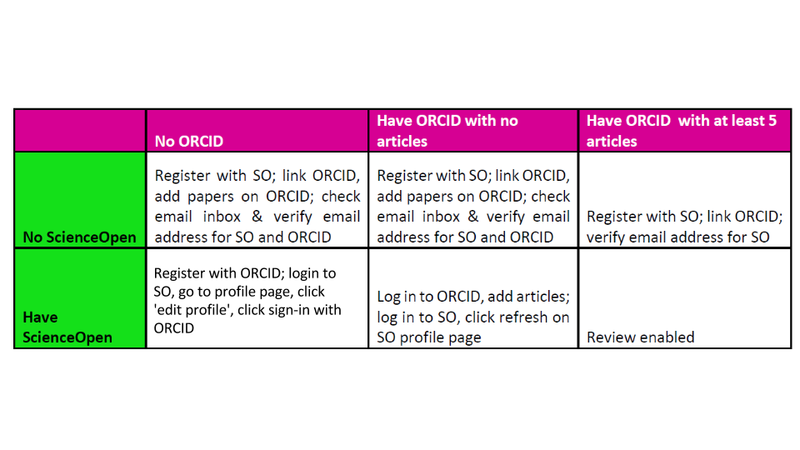 In fact, if you register with us, we will automatically provide you the options for registering with ORCID. At ScienceOpen, we have always supported the use of ORCID within our services. Membership at ScienceOpen can be updated directly using your ORCID profile, providing seamless integration of the two. To comment, review and rate articles, we require an ORCID along with membership at ScienceOpen. If you have more than 5 articles within your ORCID profile, you’ll gain Expert member status with us, and free reign of services! We feel this is important to maintain a high standard of quality for our peer review services. This isn’t to say that those without ORCID wouldn’t be great referees, it’s just that this is an explicit minimum standard. Here’s a little table to help make this a little easier to understand. We’re evolving all the time to adapt to the needs of the research community, so please let us know if there’s anything we can do to enhance our services! At ScienceOpen, there’s nothing more we like than good news for open science! That’s why we’re happy this week to see ORCID announcing a new partnership with the DFG, the German Research Foundation and major government funding body here, to support increased ORCID adoption in Germany. The aim of this partnership is to standardise and integrated information that is currently distributed throughout more than 230 systems and databases in Germany. By adopting ORCID, this will support German universities and research institutes in implementing ORCID in a co-ordinated and sustainable approach. “Thanks to the financial support from the Deutsche Forschungsgemeinschaft we have now the opportunity to promote the use of ORCID in Germany. This is a strong signal for ORCID in Germany,” says Roland Bertelmann, head of the Library and Information Services at the German Research Centre for Geoscience (GFZ). ORCID is a critical part of research infrastructure, acting as a unique identifier for researchers, and a sort of LinkedIn style profile with your published research, and educational and professional histories embedded, and partnered with tools such as CrossRef/Scopus to make content integration easy and automated. An ORCID is required to publish with us too, so we know who you are! This of course now means that engaging with the ScienceOpen platform for researchers in Germany just became a lot easier! Lucky them!